The first patent for a roller skate was reportedly issued in Paris, France, in 1819. It went to a M. Petitbled whose invention had three wheels (inline, of course) of either wood, metal or ivory. Petitbled claimed his skate could do anything an ice skate could do. But his claim seems doubtful given the hard materials used for the wheels. Wood, metal or irory wheels would likely slip on hard surfaces, making turning and pushing (for propulsion) difficult. Reuben Shaler's skate design was an attempt to remedy the situation. Shaler was an inventor who lived in Madison, Connecticut. He is best known for inventing a lovely little bullet that was used in the Civil War. When it was fired, the bullet split into three parts so as to make more holes in its victims. In 1860, Shaler patented his "Wheel-Skate." (It appears to be the first roller skate patent of any kind issued by the U.S. Patent Office.) Shaler's "Parlor Skate," as he called it, had four wheels attached by "axes or pins" to a "hanger," which resembled a modern inline frame. The skate's main innovation was an elastic ring -- preferably, Shaler says, of rubber, but conversely of leather -- that allowed the wheels "to take a better hold upon the floor or carpet." 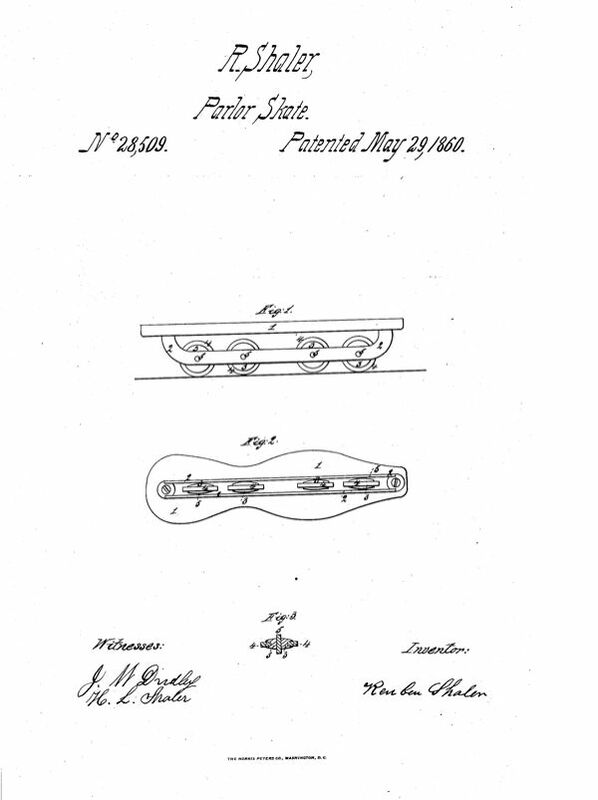 "I am aware that a skate with inflexible metallic rollers ... has been known before the date of my invention," Shaler explains in his patent description. "This skate is, however, impractical and has never been used to any great extent, doubtless for the reasons that it is incapable of giving the necessary lateral adhesion to a smooth floor to enable the skater to perform the necessary evolutions of skating, or even to obtain by such adhesion the necessary motion in the operation of striking out." A skate with metal wheels, he continues, is also "noisy in its operation and ... liable to mar a floor or carpet on which it may be used." "My invention remedies these fatal defects ..."
"My invention," Shaler writes, "remedies these fatal defects and gives a surface of contact, which ... gives the necessary adhesion and ... makes it harmless to the floors on which it may be used." The wheels of Shaler's skates were made of "iron, brass, or any other suitable material." They were grooved to provide a place to secure the elastic rings. The rings fit into the grooves and project out from them. The rings could be made of "leather or some other substances, although I prefer india rubber," Shaler says. "The elasticity and closely fitting nature of the rubber ring causes it to fit very snugly to the floor or carpet." Shaler claims these "elastic rollers" enables the skater to perform "the same evolutions ... that he could perform upon ice with an ordinary grooved skate." So how did Shaler's skates perform? ... I think it's safe to say that he was more successful making bullets. But one thing is clear: The Shaler Parlor Skate never caught on. The skate that did, a few years later, was Plimpton's quad roller skate. As we all know, no inline skate caught on until Scott Olson came along in the late 1970s and gave us the Rollerblade.  Beginner's Guide to Inline Skating!